Bedford 120hp 6cylinder main driving a three blade bronze prop. through a Borg Warner box. 220v power from shore power or 12 Kva Lister Peter generator (new in 2006) or from 3Kw sine wave inverter powered by 8 Trojan 6v 260Ah batteries. Total top sides repaint 2013 from bare metal 2 coats epoxy primer followed by 2 coats epoxy finish. Sympathetic superstructure complements the Luxemotor lines and cruises even the Canal du Midi wheelhouse up!! Really autonomous live aboard with stainless steel water tank and +/- 1000 lts/hr water maker, 12Kva electric generator. Modern equipment in a classic ambiance. Fully fitted for comfortable life aboard. Satellite TV, air-conditioning, central heating to radiators (plus a wood burning stove in the lounge) washing machine to +/- 1000lts / hr. water maker. Vast wheelhouse saloon and deck terrace. "PC Navigo" & ASUS laptop. 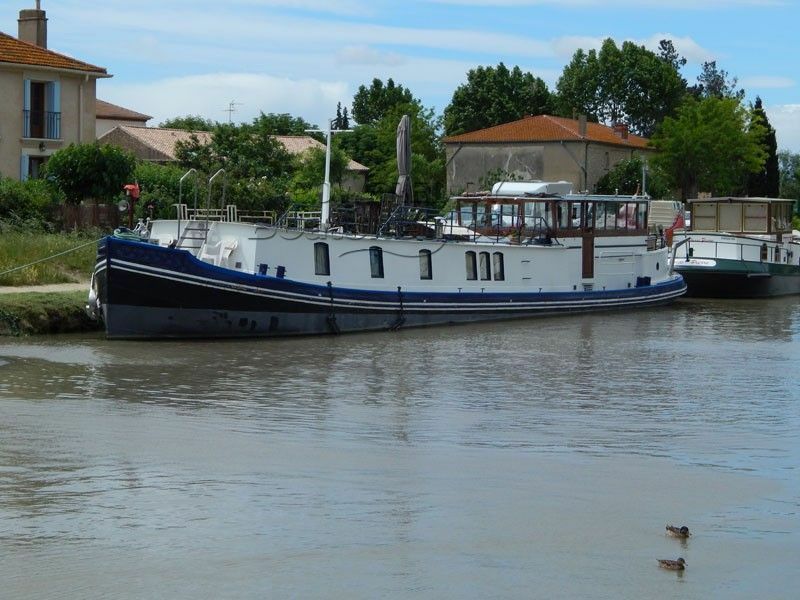 Live aboard barge for sale in France! Boatshed Midi Canals is pleased to offer this 22M Luxemotor Dutch Barge for sale on the Canal du Midi. Massive investment by the present owners who have managed to maintain an air of simple charm in a cosy fit-out whilst incorporating no-nonsense modern equipment for comfortable autonomous living. LED lighting, 6v domestic batteries, black water tank, water maker, air-conditioning & 12 Kva generator. The list is long and reflects considerable cruising experience. This boat cruises the Canal du Midi WHEELHOUSE UP! For more information and appointments to view, please contact Graham WHARMBY your Boatshed Broker at Boatshed Midi Canals. This Dutch Barge 22M Luxemotor has been personally photographed and viewed by Graham Wharmby of Boatshed Midi Canals. Click here for contact details.